Australia and its territories have 898 recorded bird species. Climate change is a serious concern and it is expected that around 10% of the species will become extinct because of climate change by 2100. Below is a list of most common Australian birds found in Australian cities and suburbs. This list is not a complete one and the only purpose of collecting these details is to give a bare minimum introduction to a new immigrant so that they can identify these birds when spotted. 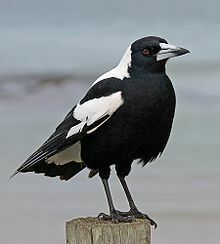 This is Australia’s most urban bird, found throughout the continent particularly in the coastal areas. The head, body, and tail are white. The wings are light grey with white-spotted, black tips. They thrive in shopping centres and garbage dumps. This scavenger loves to feed on potato chips but their natural diet is worms, fish, insects and crustaceans. 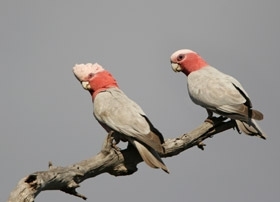 Galah is also known as rose-breasted cockatoo and galah cockatoo. It is found all around Australia. They have grown more abundant by human influences, because they eat crops and make use of the cattle drinking ponds. 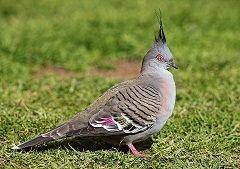 Their plumage is splendid combination of grey and pink. They are distinguished by a short bill, small pointed crest, blue skin that circles the eye. While flying a lemon- yellow underwing and tail are visible from below. 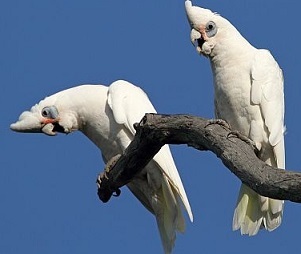 They are also known as bare-eyed cockatoo, blood-stained cockatoo, short-billed corella, little cockatoo and blue-eyed cockatoo. They usually feed on ground but occasionally feed on trees and shrubs. They are very noisy birds and good in show off. They travel in large flocks. 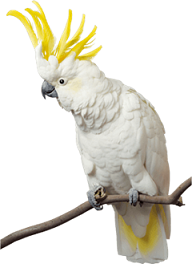 These white birds with striking lemon yellow crust and dark bill are commonly found in Australian suburbia. These highly intelligent birds can be demanding pets. They can be found widely in the north and east, ranging from the Kimberley to as far south as Tasmania, but avoiding arid inland areas with few trees. They are capable of synchronising movements to a musical beat. Budgerigars are found wild throughout the drier parts of Australia where the species has survived harsh inland conditions for the last five million years. 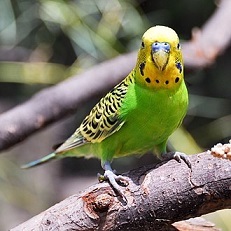 Budgerigars are naturally green and yellow with black, scalloped markings on the nape, back and wings, but have been bred in captivity with colouring in blues, whites, yellows, greys and even with small crests. They are also popular pets. They are nomadic birds found throughout Australia. They feed mostly on grass seeds from ground. They breed in small colonies and nests in tree hollows or cavities. 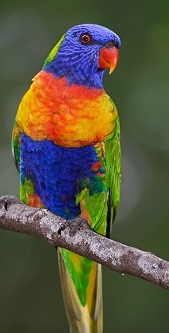 They are true parrots and is found commonly in the eastern seaboard from northern Queensland to South Australia. They are introduced in Perth, Tasmania and Western Australia. The head is deep blue with a greenish-yellow nuchal collar, and the rest of the upper parts (wings, back and tail) are deep green. The chest is red with blue-black barring. The belly is deep green, and the thighs and rump are yellow with deep green barring. In flight a yellow wing-bar contrasts clearly with the red underwing coverts. They mainly feed on fruit, nectar and pollen. They are very human friendly birds. 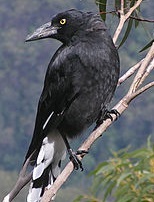 Australian magpie is Australia’s song bird. This species has adjusted to the suburban way of life. The male has pure white feathers on the back of the head and the female has white blending to grey feathers on the back of the head. With its long legs, the Australian magpie walks rather than waddles or hops and spends much time on the ground. They are infamous for swooping during the breeding season. This bird is whole in all black in colour. 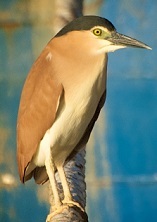 The adult males have white irises, younger adults have a white iris with an inner blue rim, while younger birds have dark brown irises until fifteen months of age. They eat wide variety of plant and animals and is an opportunistic feeder. They are peaceful birds showing no aggression towards humans. A long down curved bill and white and chestnut plumage, this honey eater is very much a suburban bird. They are usually found in the gardens, forests and bushlands. They feed on nectar and blooms. 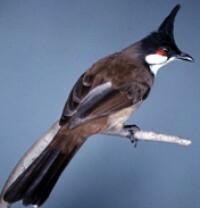 Red Whiskered Bulbul has a pointed black crest, white cheeks, brown back, reddish under tail coverts and a long white-tipped tail. They are used being around humans, perching prominently on the top of bushes or on power lines. They are an introduced species. 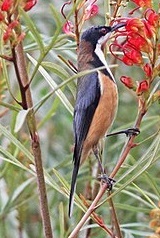 They feed on fruits, insects and flower buds. 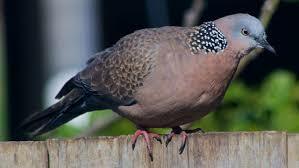 Spotted dove was introduced to Australia in the mid 1800’s. 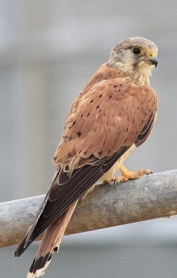 They have mostly light brown above, with darker centres to the feathers of the back and wings. The head is grey, and the neck and underparts are grey-brown, tinged with pink. . The distinguishing feature is the large black collar on the base of the hind-neck, which has many white spots. Sexes are similar in plumage. They feed on grains and seeds. 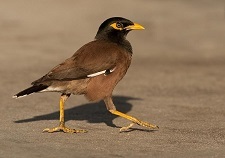 Common Myna is also known as Indian Myna. It is brown in colour with a black head and a yellow bill. Common Myna is not native to Australia. It is an introduced species. This is a honey eater and the smallest of the wattle birds. It is mostly dark grey – brown above with faint white shafts on each of the feathers. Eye is blue to grey. 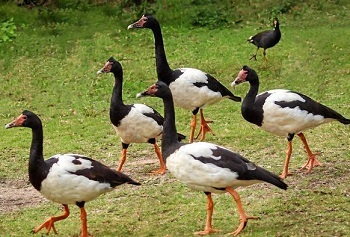 Huge flocks of Magpie geese often comprising thousands of birds accumulate at drying wetlands in Northern Australia during the build up to wet season. These birds widespread in Southern Australia too but disappeared as the wetlands disappeared. This goose like birds have long orange – yellow legs, narrow bill and a knobbed head. 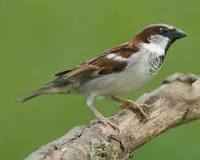 The House Sparrow was introduced in Australia from Britain between 1863 and 1870. House Sparrows occur in and around human habitation, as well as cultivated areas and some wooded country. They feed on wide range of food stuff and due to this they survive anywhere. They usually form permanent pair bonds. This bird nowadays is considered as a pest. 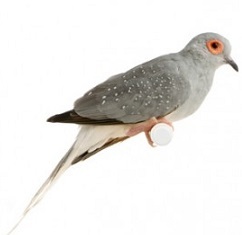 This is one of the smallest among Australia’s pigeons. They have a grey head and neck and a red eye ring. They are usually seen in small groups or pairs feeding off the ground. This species is also domesticated in Australia. They are found in habitats ranging from humid forest to arid savanna, as well as in suburban areas with tall trees or near running water. 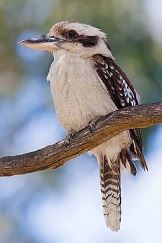 Four species of Kookaburras are found in Australia. Rufous-bellied kookaburra, Spangled kookaburra, Blue-winged kookaburra and Laughing kookaburra. Laughing Kookaburra makes a sound similar to human laughing. This is a very common urban bird. These birds are found all around Australia except in very dry areas. Colouration is grey with tinges of brown and green. It has a feathered but slender, black spike on top of the head. It runs with the crest erect. 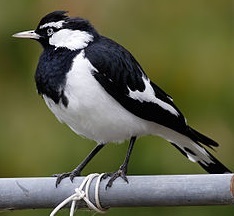 They have a black and white plumage and a common bird in Australian suburbs. They are found all around Australia. They eat all sorts of small creatures and can adapt to an enormous range of different habitats, requiring only some soft, bare ground for foraging, a supply of mud for making a nest, and a tree to make it in. This is a grey bird, with a black head, orange-yellow beak and feet, a distinctive yellow patch behind the eye and white tips on the tail feathers. 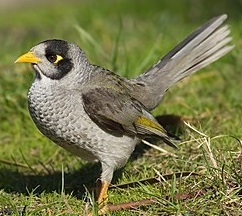 The noisy miner primarily inhabits dry, open eucalypt forests that lack understory shrubs. They are territorial birds and defend territory communally, forming colonies that can contain several hundred birds. They mainly eat nectar, fruit and insects. 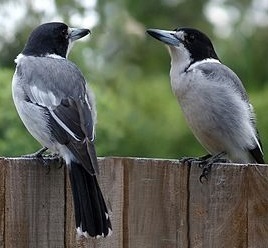 They are closely related to butcherbird and Australian Magpie. They have a melodious voice. 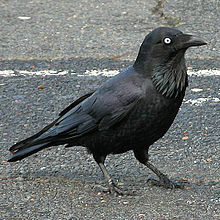 It is a crow like black bird with white in the wing, yellow iris and a heavy bill. Most widespread and abundant, small goose like water fowl is found all around Australia in the wetlands. Male and female have different coloured neck and heads. These are sedentary birds, very reluctant to fly. They usually nest in tree hollow. The black swan is a large waterbird, a species of swan which breeds mainly in the southeast and southwest regions of Australia. Mostly they are with black plumage and red Bill. Both Male and female share incubation and cygnet rearing duty. 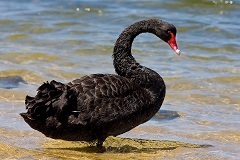 The black swan is widely seen at the wetlands of southwestern and eastern Australia and adjacent coastal islands but rarely found in central and Northern Australia. 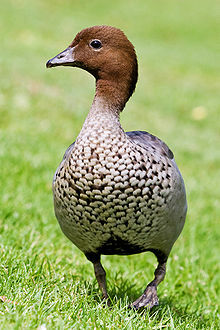 This is one of the most common duck species found in Australia, virtually at any wetland. They usually nest in tree hollow. 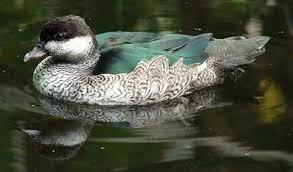 They hybridize with domestic ducks and feral mallard ducks. They are very sociable birds. It has a dark body, and a paler head with a dark crown and facial stripes. In flight, it shows a green speculum and pale underwing. They usually fly from one wetland to other. This species widespread in Australia except in desert regions. The male is grey with a dark brown head and mottled breast. The female has white stripes above and below the eye and mottled underparts. They make their nests usually close to water and the chicks can walk or swim soon after hatching. These birds are more common inlands than coasts. It is found all around Australia in wetlands. The bill is black and the facial skin is commonly blue or yellow. 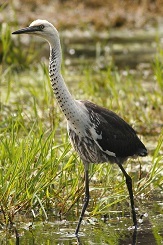 In this species of heron the eyes are green and the legs and feet also being black and the neck is pure white – this makes them easily recognizable. It is a very shy bird. They roost during the morning and feed primarily at night in shallow water on a wide variety of insects, crustaceans, fish and amphibians. This bird stands about 60 cm tall with a stooped appearance. They are found all around Australia except on arid land. This sociable bird species is usually seen feeding in groups of around 40 – 200 birds. 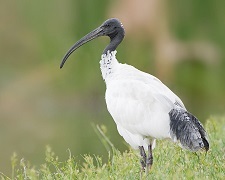 It has a predominantly white plumage with a bare, black head, long down curved bill and black legs. This species is widespread across Australia. This species used to avoid suburban areas but now a days found in Australian cities too. 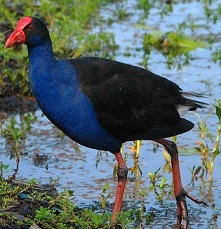 This bird is a common sight in any waterways and found across Australia. 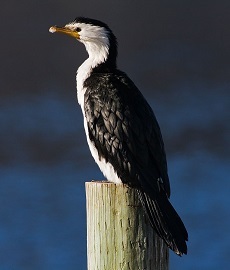 It is a small short-billed cormorant usually black above and white below with a yellow bill and small crest. They lay green eggs. This solitary feeder finds its prey on the sea floor, prefer to dive on shallow waters. This large Australian bird of prey is also known as Smoke hawk. This species can be spotted throughout Australia. The female of the species is smaller than males. 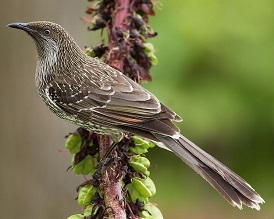 This terrestrial bird usually prefers open grasslands, open woodland and shrub land. They prey mostly on terrestrial mammals such as bandicoots, bettongs and rodents as well as small birds and reptiles. This is one of the smallest falcons. This got the name as the colour of the bird resembles cloth from Nanjing (Nankeen) in China. Typically seen singly or in pairs, they can aggregate into loose flocks of up to 30 when conditions are right. Diet is varied, with a large number of insects, but also small birds and reptiles, and in particular, small rodents, mostly mice. 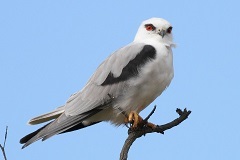 This is one of Australia’s most wide spread birds of prey. These birds engage in aerial courtship displays which involve high circling flight and ritualised feeding mid-air. They lay around four eggs and the chicks are fully fledged within five weeks. They usually hunt singly or in pairs. Grasshoppers, rats, small reptiles, birds, rabbits and mice form their diet. 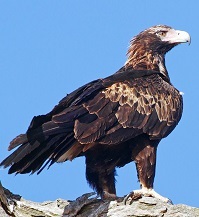 This is Australia’s largest bird of prey. Young eagles are a mid-brown colour with slightly lighter and reddish-brown wings and head. As they grow older, their colour becomes darker, reaching a dark blackish-brown shade after about 10 years. They are highly aerial, and can fly for hours without wingbeat. They are common throughout eastern northern Australia. They are predominantly vegetarian but they also eat small number of insects. They have a broad dark blue collar and dark blue to purple plumage. The bill is red in colour and the legs and feet are orange red. They are accomplished fliers too.